For a Thanksgiving Monday night, the Dakota Tavern was cozily crowded to watch a musician sing and play his guitar on their understated, sparsely lit, rustic stage. The venue was filled with applause and cheers as Neil Halstead, one soft-spoken and relaxed British musician, took the stage with an acoustic guitar. Halstead, of course, is not just any musician. He is one of the founding members of Slowdive, one of the most influential shoegazer bands to emerge from the 90’s. He is also known for Mojave 3, a band he formed following the disbanding of Slowdive. 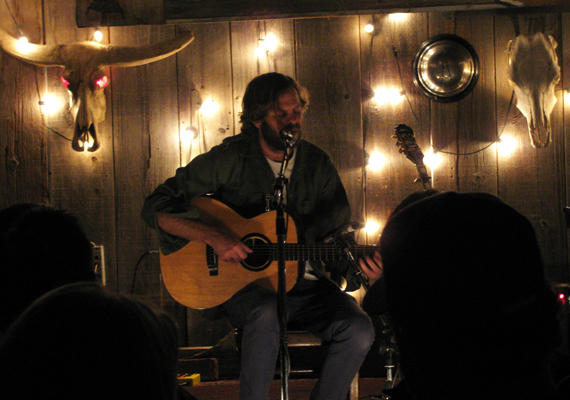 Halstead also has three solo albums under his belt; most recently, Palindrome Hunches, which he is currently touring. In his songs, lyrically, Neil Halstead seems like he might be the sad sort, moping about lost loves, dying and general depressing stuff. Instead, he proved himself to be warm and gracious, with a dry sense of humour. Several songs into his set, after playing the melancholy “Who Do You Love” from Out of Tune, Mojave 3’s second album, Halstead removed his harmonica headpiece, remarking that his beard has gotten to the length where it’s almost too long to play the instrument. The hairs get stuck in the slots, he chuckled. He deadpanned that at a show he played recently, he realized his beard was stuck in his harmonica. As a result, he was forced to play several more songs with harmonica until he could get unstuck. The Dakota’s intimate setting and low stage helped it feel like a gathering in a (bar-sized) living room, watching a (very talented) friend play some songs. It felt even more so when the audience sang “Happy birthday” to Halstead, whose birthday was the day before, October 7. Halstead seemed genuinely moved and thanked the audience for the kind gesture. Halstead suggested the audience could shout out song requests and perhaps he could accommodate. Unsurprisingly, there were several Slowdive song requests, including “Souvlaki Space Station.” Halstead smirked and played the opening riffs to the song to delighted cheers, before moving on. The set list included many of Halstead’s solo tunes, with several Mojave 3 songs thrown in the mix, including “Prayer For the Paranoid,” “Some Kinda Angel” and “Give What You Take.” He was occasionally joined by an accompanist named John, who played piano, bass and guitar on a handful of songs. Halstead’s signature raspy and emotive voice filled the room, which was so quiet at times, you could hear a knuckle crack. He sounded exactly as he does on record, if not better. When a fan asked Halstead to confirm whether a Slowdive reunion was in the cards, Halstead responded that it was a definite possibility. “Start by petitioning Rachel [Goswell] first!” he smiled cheekily. With this affirmation from the man himself, there were undoubtedly countless shoegazer hearts skipping a beat with joy.